<Blackboard’s tool for public communication or public submission of writing by students. Tip: Do not click here. Use a discussion in its Learning Module. < Blackboard’s tool for personal communications, such as your prof sending you feedback on writing. Tip: This is the fastest way for you to reach me. < Blackboard’s tool for public news. 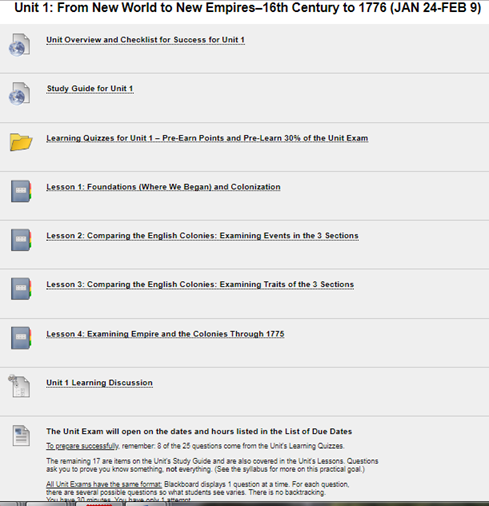 If something has long-term value to students, I will copy it to General Course Questions on the Learning Modules page. For example, this screen was made before the course opened. 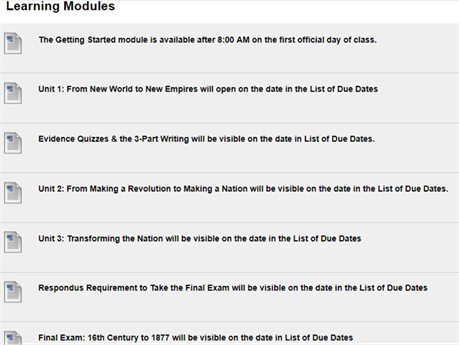 At 8:00 AM, that first item will be gone and you will see the actual Getting Started module. < For the date, use the List of Due Dates – If any date changes to a later, I will change this and make an announcement. < For where to work, use the List of Due Dates. It tells you where the work is located. < A useless tool to figure out what you have to prepare. It only tells you when it is due.